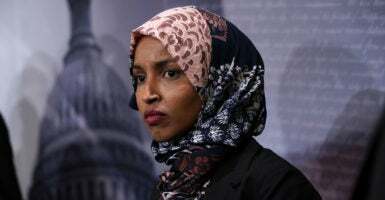 Democratic Minnesota Rep. Ilhan Omar responded to President Donald Trump’s calls to resign over her anti-Israel comments. “You have trafficked in hate your whole life—against Jews, Muslims, Indigenous, immigrants, black people and more. I learned from people impacted by my words. When will you?” the first-term congresswoman tweeted Wednesday morning. Omar’s tweet was in response to comments Trump made Tuesday while speaking to reporters in the White House Cabinet Room. The controversy began when Omar quote-tweeted an article about her harsh criticism of Israel. The comments mirrored longstanding tropes against Jewish people and financial influence. Vice President Mike Pence called her comments a “disgrace” and her apology “inadequate.” His statements reflected growing calls to remove Omar from the House Foreign Affairs Committee. Jason Hopkins is an energy investigator for the Daily Caller News Foundation.